The home where San Diego Padres hall-of-famer Tony Gwynn lived up until his untimely death in 2014 has been foreclosed on and will be auctioned off on Wednesday. A legal notice published this week said that over $2.5 million was owed on the north Poway home and will be sold to the highest bidder at an auction later this week. The property will go back to the lender if there are no takers. Gwynn, considered the greatest hitter in Padre’s history, won eight batting titles during his 20-year run with the team and was inducted into the Baseball Hall of Fame in 2007. His family moved into the 7,360-square-foot, six-bedroom home more than two decades ago. 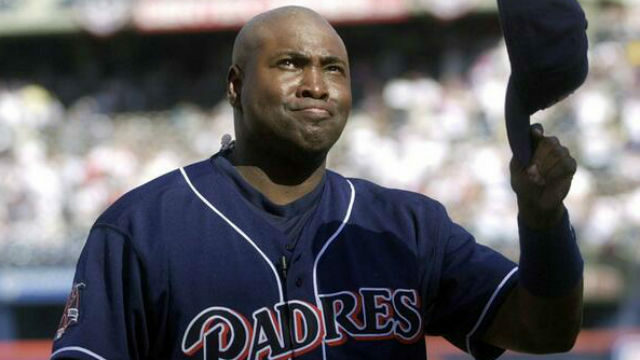 Gwynn died at age of 54 after a long battle with salivary gland cancer. The home — on Boulder Ridge Lane in a wealthy suburban enclave about two miles east of Lake Poway — will be auctioned off at 10 a.m. June 6 in the courtyard of the East County Regional Center in El Cajon, according to the legal notice.